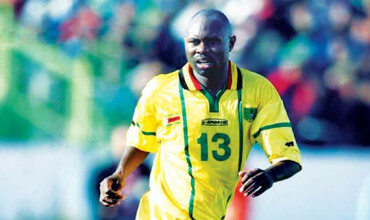 ADAM Ndlovu is one of the most lethal strikers to ever don the green and gold of the Zimbabwe team. A member of the legendary football family Adam was second only to his younger brother, Peter, as Zimbabwe’s highest ever goal scorer. But the 34 goals he scored in the special green and gold of the Warriors do not tell the true story. Adamski as Adam was affectionately known was the saviour of that team for many-a-times with his super sub appearances delivering a moment of magic for a nation that so badly needed cause to smile. The Reinhard Fabisch coached ‘Dream Team’ of the 1990s was perhaps the most distinguished period of Adam’s career. Back then in the 1990s Zimbabwe saw football as more than a religion as the nation’s mood changed along with the fortunes of their beloved Warriors. In that team Adam had the unforgettable experience of playing alongside his two brothers in the same team. It became a family affair with Madinda and Peter in the same team, a trio whose exploits would make them some of the most iconic names in Zimbabwean football. But for the greater part of his career the Zimbabwe centre striker lived in the shadows of his younger brother, Peter, a player who remains one of the longest serving African footballers in the English premiership. A lot has been written about how Peter was the personification of the Warriors for so long. Even if Peter’s brilliance tended to overshadow the special player his brother Adamski, Adam never had any hard feelings. Sadly the smiling assassin tragically died in car crush in 2012 which was being driven by Peter. Adam began his professional career at Mhlangeni United before being snapped up by Highlanders FC in 1987 as a 17 year old. He stayed at the Bulawayo giant’s side for six years, and in 1994 he made the great trek to the North and featured for Switzerland top tier sides such as SR Delmont, SC Kraines and FC Zurich. At FC Zurich Ndlovu played alongside the likes of South Africa’s Shaun Bartlett and Seydou Keita of Mali. The year 2000 at FC Zurich was to be Ndlovu’s most accomplished year at the club as he scooped the best player of year award and was also crowned the league’s top goal scorer with 38 goals in the season. After a nine year stint in Switzerland, Ndlovu came back to the play for the Bulawayo giants, Highlanders, for a season; before trekking to the South African premiership to play for Dynamos Polokwane, Moroka Swallows and Free State Stars after which he called time to his illustrious career.